(New) Herald in the News! So, having looked back to review a bit of what’s happened in this blog and to me in the year now past, it’s time to look forward to what’s coming up in the new year. First off, of course, I intend to continue to meet my self-established goal of posting a minimum of twice per week. There will times, I expect, where I will exceed this goal, as I have in the past. And I hope to be able to make the time to work on a couple of new heraldic projects, as well as getting back to work on a couple of others, in the coming year. One new one is intended to be a short article of the changes in depiction of the crest of the Winslow arms over the years. The crest is a tree stump putting forth new branches, and it appears to me that the depiction has gone from an original intent of having the shield of the arms “hang” from the crest by its strap (or gige) to something that eventually became something that looks like a halo or a bicycle inner tube encircling the stump. Weird, huh? So, that’s some of what I’m looking forward to heraldically in the coming year. I hope you’ve enjoyed your visits here, and I also hope that as you come back to this blog you will continue to find what I write about here to be interesting. Thank you for dropping by, and I look forward to your visits in the coming year. Well, here we are at the end of another year, and our thoughts naturally turn to looking back to see what’s been accomplished in the last twelve months. In addition to keeping to my initial resolution for this blog when I first began it, that of posting at least twice a week, I feel good about having met that goal. And I hope that the one hundred and some odd posts this year have been at least occasionally interesting and informative to you. The number of visitors to this blog has been increasing at a slow but steady pace, and I appreciate those of you who drop by and take an interest in what I’ve said here. It’s been interesting to me to see where the visitors come from: from every continent except Antarctica (so far); from large countries (e.g., Russia) and small islands (e.g., the Canary Islands). Thank you all for dropping by. 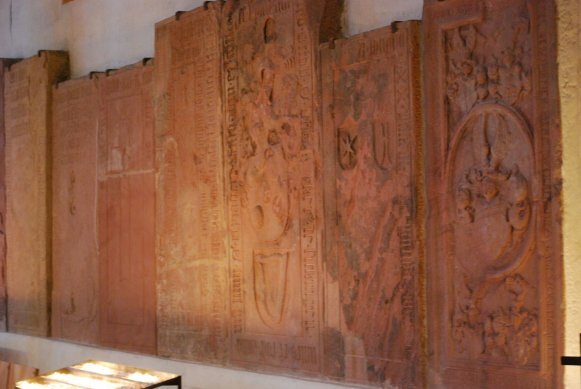 The castle overlooking the city of Heidelberg has a long and complex history. It has stood in ruins for a very long time, and the state is in the process of restoring parts of it and turning it into a tourist attraction. 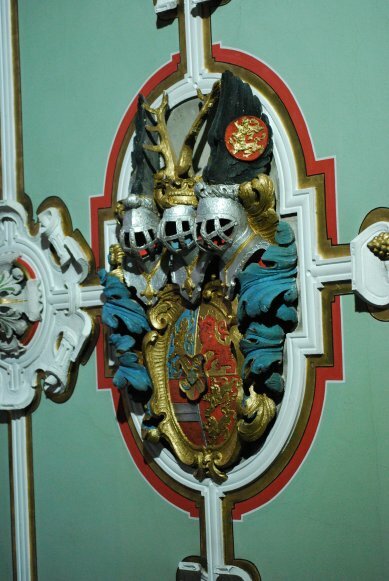 What’s great about that for the heraldry enthusiasts is that the place is chock full of coats of arms, from inlaid tables to fireplace mantels to stained glass windows to deeply carved and painted renditions on the ceilings. Now, when I say deeply carved, I mean exactly that! The image above is only one of a number that I was able to photograph while we toured the castle. It’s probably a bit too “foo-foo,” as my wife would say, for me to try installing at home, but it sure is impressive to see in a large room or a long hall. 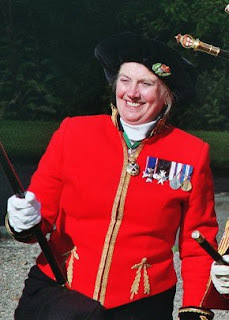 Indeed, it was almost humorous to watch all of the heralds among our group walk into a new room or hall and immediately look up and wander about never seeing our feet, attempting to be careful not to bump into each other, trying to take all the heraldry in! The other special bit of heraldry in the Holy Spirit Church in Heidelberg that I’d like to share with you was affixed to one of the long walls inside the church. Still, there was a nice variety of arms depicted on the stones (on some of them, though, you could only see where a coat of arms should have been but which has been worn down until it is impossible to make out what it was), and I appreciate the fact that the church has tried to preserve them when they made renovations and restorations to the building instead of either tossing them out or cutting them up and “repurposing” them. Congratulations to Elizabeth Roads, Snawdoun Herald! One of the other things that I was hoping to see in our day at Heidelberg is the Holy Spirit Church there. And, in fact, if you knew what you were looking for, you could find it very easily from the heights that the castle there sits on. Yeah, it’s that “little” building in the center in this photo. I was looking for it, not because I knew that my great-grandfather had attended there, but because I had found a number of individuals of the same (very rare) surname, Lischett, who had attended there, and I pretty much figured that if their name was Lischett and they lived in or around Heidelberg, they also pretty much had to be a relative. I was fortunate in that our tour group walked right past the church on our way to lunch. And I saw that it was open. So I ate my meal a little faster than everyone else, and hot-footed it back down the street to the Holy Spirit Church, where they not only let me inside but said (after I asked; I always ask first) that I could take photographs. So I did. For the next 45 minutes or so, until the rest of the group was ready to head down to the river for our boat ride up and down the Neckar River. Have I mentioned before that you can find heraldry everywhere? I seem to recall mentioning it once or twice before. And it was equally true here. 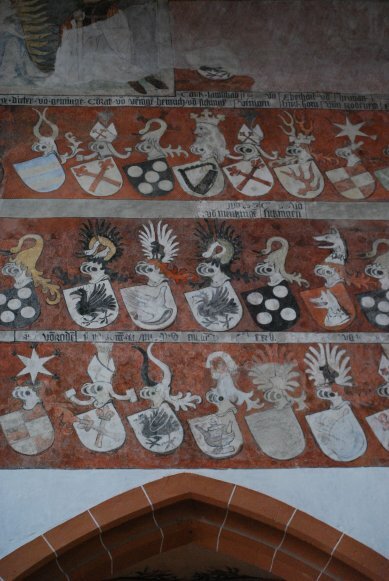 One of the coolest bits of heraldry was an old painted wall inside the church that had been uncovered during some restoration work. How cool is that? Wander off looking for relatives, and find a painted armorial of knights. Well, it's happened again! I mean, I know I've said it before, and on a regular basis I run across something that proves it to me again. "You can find heraldry everywhere!" And it's true. We were out Saturday visiting a favorite antiques mall just because we hadn't been there for a while. And in wandering the aisles looking at what they had, I ran across -- wait for it -- more heraldry! 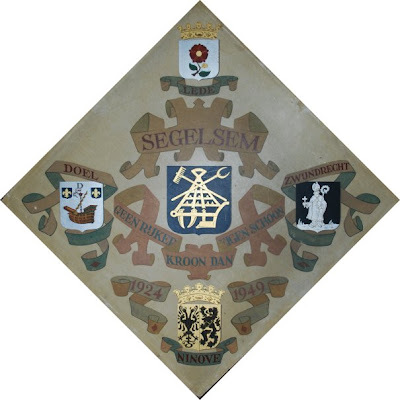 The scroll under the Zegelsem arms, Geen rijker kroon dan eigen schoon, which Babelfish roughly translates as "No richer crown than own clean," is a sentiment that (if I am understanding it correctly) I can certainly agree with. We will now return you to our continuing posts about the heraldry we found on our European trip in September. 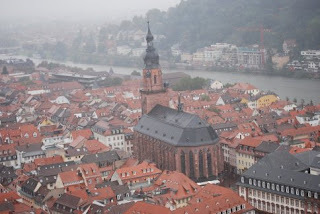 There were five different choices for day trips during the recent International Congress of Genealogical and Heraldic Sciences held in Stuttgart, Germany, one of which was an excursion to Heidelberg. I, frankly, leapt at the chance to go on this trip, since my great-grandfather was born in Heidelberg and had emigrated from there to the United States in 1881 at the ripe old age of 14. So it was an opportunity to visit the “auld sod,” as my father would say, and at the very least see some of the things that would have been familiar to my great-grandfather during his youth there. On the front of the main cabin of the boat someone had painted a very nice rendition of the coat of arms of the city of Heidelberg. 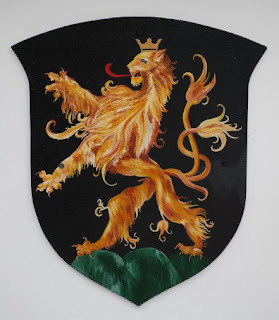 Indeed, I don’t recall seeing many paintings of heraldry that felt quite so vibrant. It’s a beautifully done piece of work, and the unknown artist is to be congratulated. In my not always so humble opinion, anyway. And, in fact, wandering among the display cases of glass, both armorial and not, I ran across yet another coat of arms (and crest) with a camel! The arms are given on the glass as those of Barbara Zeilnerin (the arms on the other side of the glass are those of her husband, Lorenzo Biller, and do not contain a camel), made in Hall, Tyrol 1560-1580. The arms may be blazoned as Gules a camel statant argent crowned or, and the crest might be blazoned as Issuant from between a pair of buffalo horns gules, a legless demi-camel (or a camel's head, neck and back) argent crowned or. I find the coat of arms particularly interesting because the arms to not seem to be canting; that is, they are not a pun on the surname. The majority of arms with camels that I have found are cants, where the surname is Camel, Cammell, Kamel (in German), Chameau (in French), and so on. But I cannot find such a pun on the name Zeilnerin. I may have to do some research to see if I can find out anything more about the coat of arms and why it contains a camel. This entry and the next one come courtesy of the glass collection in the Württemberg State Museum located in the Old Castle (Altes Schloß), in Stuttgart, Germany. They’ve got a wonderful collection of glass, with some pieces dating back to the Roman empire. But, of course, those pieces contain no heraldry. One of the things that I particularly enjoy looking at is the ways in which different artists will emblazon (draw) the same coat of arms. 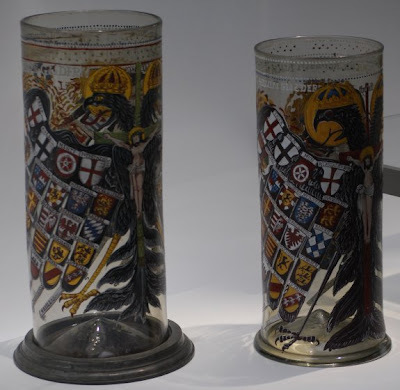 In one particularly nice example of this, in the glass collection at the Old Castle are two tall glasses displayed right next to each other, both with the double-headed eagle of the Holy Roman Empire, its wings emblazoned with the coats of arms of the various states of which it consisted, but each done by a different artist. The most noticeable difference between the two depictions is the arms of Bavaria (Bayern), which in the glass on the left are the usual lozengy (or even fusilly) bendwise, while the one on the right is strictly lozengy. 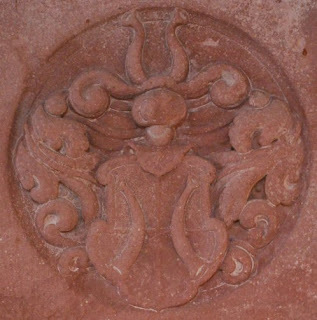 There are other differences between the depictions of the various arms between the two glasses, but mostly these are in the detailing. Still, it can be both entertaining and educational to compare how different artists draw the same coat of arms. And isn’t that part of the fun of heraldry?